The world is our playground and we can now communicate across the globe - people in Amsterdam know what’s happening in Sidney and thus like. Where sometimes public and private overlap, there is a need for more privacy. We long for something true and intimate, something that touches our hearts – something beautiful like a portrait of our children. Tiny Tale doesn’t claim to heal the world, but it does aim to make it a more intimate, sheltered, smaller place for people who wish to share. Bringing back family values and the warmth and comfort this brings to our lives. Our children are the people that matter the most to us all, especially to parents and grandparents, Tiny Tale realises this and puts them first. Nothing is more sacred and more beautiful in life than sharing your children’s special moments but to also experience these events as a family group together. Tiny Tale brings joy and that extra “sparkle” to the wider family net of grandparents, aunts, uncles and friends. The inventor of Tiny Tale, a father of two young children himself had lost (after years of storing films and photos) the overall view and he found himself wanting to be able to save all these memories in one place. A place where grandparents could also see all these beautiful moments of their grandchildren as well. Available for iPhone, Android & Web! But Merlijn wants more than just saving and sharing his pictures. He has a clear vision of what he wants, his wish is to enable interaction between families and loved ones. 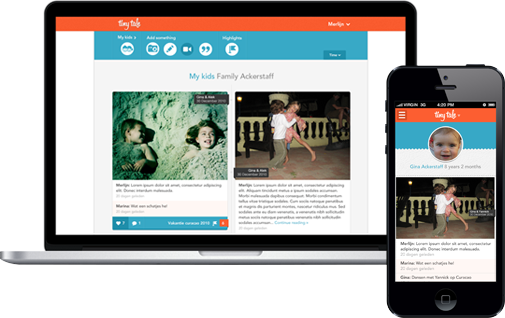 To communicate with each other about their children’s lives especially capturing moments, anecdotes and quotes. So together you can build and live the story of your children in chronological order, eventually making it into an old fashioned photo book 1.0 in a snap. Welcome to Tiny Tale, we hope your family members too will get an extra boost by capturing the lives of your children!